Diamond Skills Camp was started to provide youth a safe, energetic, fun, and competitive environment to improve their baseball and athletic skills. (1) We pride ourselves on having each day be unique. No one day or session is the same. A camper can come to every Diamond Skills session and they won't be bored with the same drills. (2) The tuition for each of the full-day session is less than $8 an hour! It is hard enough finding a baby sitter at that price, let alone having multiple high school coaches, college coaches, and former professional players working hands on with your child. (3) We offer a 9:00AM-5:00PM camp session that allows parents to work all day and know their child is in a safe environment. (4) We provide educational tools outside of just athletics. We have coaches with Strength and Conditioning and Nutritional backgrounds. Your child will receive exercise and healthy nutritional information to understand the importance of a healthy lifestyle. (5) Your camp tuition is not just for one week. Diamond Skills Camp prides itself on being available to camp parents and campers year round for instructional and advise via email free of charge. By enrolling in Diamond Skills Camp, you receive a knowledgeable and passionate coaching staff any day of the year. Parents email us throughout the year seeking coaching advice on topics ranging from "what division their child should play" to how to approach a certain pitching drill. (6) Diamond Skills Camp isn't operated like a factory. Each camper isn't treated like a number. Our staff is trained to quickly identify, evaluate, and educate each camper. From there, we coach each camper differently in a manner that will optimize his or her skill growth. A camper who may have difficulties hitting will be coached in a positive, non-peer pressure environment. By contrast, a 12 year all-star will be pushed harder and put in “pressured” situations to prepare for the next level. (7) Our overall camp philosophy is simple. TOO MANY KIDS QUIT PLAYING BASEBALL AND SPORTS AT A YOUNG AGE. OUR GOAL IS TO MAKE SURE THIS DOESN'T HAPPEN. Every camper will leave at the end of week more CONFIDENT and ENERGETIC about the game of baseball. This passion for the game, will allow for the camper on a cold, gloomy winter afternoon to still want to work on his game. We can teach every drill in the world to campers, and sure it will help a little, but if campers don't leave with the confidence and energy that we coach with, it will be hard to improve. Diamond Skills is a sponsor for Alameda Little League, Alameda Softball Association, Pleasant Hill Baseball Association and Bayshore Little League. In addition, to the camps we have taught and teach hundreds of private lessons and have worked with organizing and coaching Little League practices. 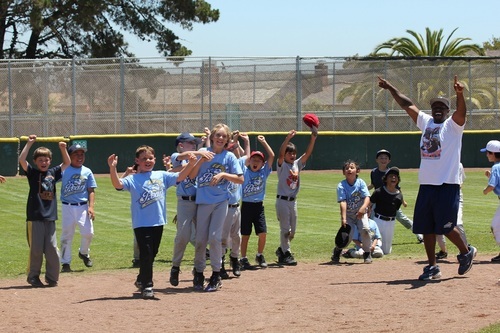 Lastly, the camp is partners with the Neptune Beach Pearl, Alameda's summer collegiate baseball team.